Get ready Whitchurch-Stouffville, there are new players coming to town! 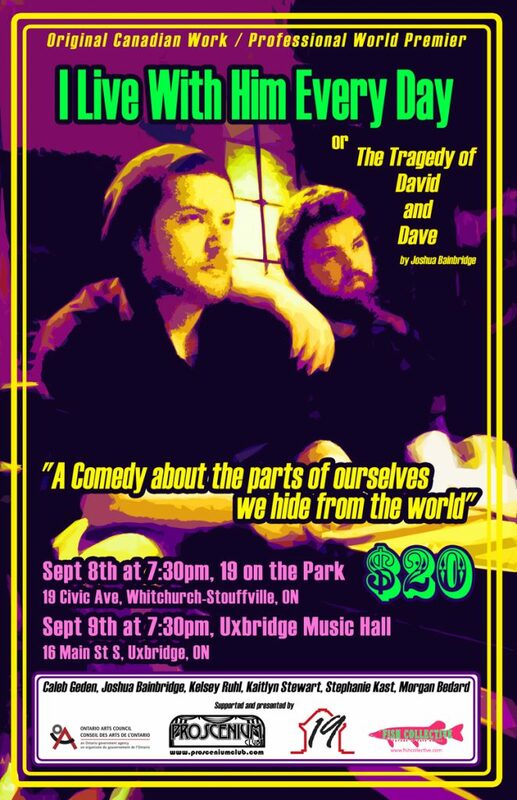 Northern Ontario’s newest theatre troupe, the Proscenium Club, will premiere their inaugural production I Live With Him Every Day or The Tragedy of David and Dave Thursday, August 8 at 7:30 pm at 19 on the Park. The premiere at 19 on the Park is one of two stops for the Proscenium Club. Following Thursday’s performance the troupe will pack up and head over to the Uxbridge Music Hall for an encore staging, also at 7:30pm. Tickets for both performances are $20 plus any applicable fees and taxes charged by the venues. This small professional tour is being conducted in collaboration with the Future In Safe Hands (FISH) Collective (www.fishcollective.com), a cross-cultural multi-arts collective of Indigenous and non-Indigenous artists operating out of the North Bay area.